Gilwern achieved another impressive win on a warm Saturday afternoon in their first home game of the season by beating Usk Town B 10-0 with a superb display of football. Gilwern took to the field with menace and began putting severe pressure on the Usk defence when Adam Carrington put Gilwern 2 nil up within the first 10 minutes, his first goal was a delightful lob over the approaching keeper. Dan Gandera once again dominated the midfield with sweet controlled accurate passing. "Spud" Randall and Ben Bergoyne who scored with a thumping header, quickly added to the total followed by an own goal. Usk were awarded a penalty which Dan Hook superbly saved to keep a clean sheet. Gilwern were in control and led 5-0 at Half time. The second half saw much of the same pressure put on Usk with Captain "Webby" and Luke commanding the back four with grit and determination. Blair Keane was a constant menace with his runs up and down the wing and was rewarded with his first goal for the club. Another debutante rewarded with a goal was Sean Chidgey who returned after injury. Gilwern were reduced to ten men after a rush of blood from Adam Carrington saw him get his marching orders from the referee. 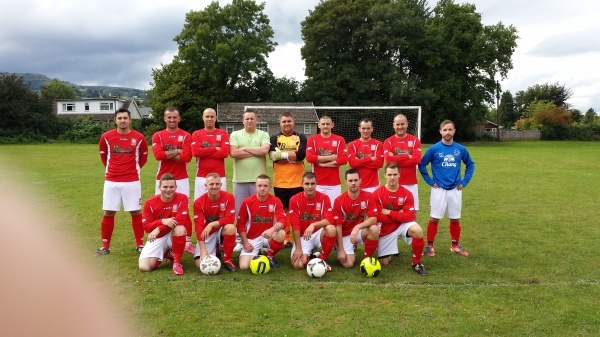 The ten man Gilwern continued to press Usk giving them little time on the ball and eventually ran out 10 nil winners. another superb win by Gilwern. Goal scorers were Adam Carrington 4, Michael Randall 2, Ben Bergoyne 1, Sean Chidgey 1, Blair Keane 1 and an own goal. Man of the Match was Dan Gandera. Action shots from the game are now available.